Vegan cole slaw is a cabbage based side dish that can include a creamy dressing or a lighter dressing made with oil and vinegar. This is a versatile salad for vegetarians, and it's easy to make it vegan as well. Cole slaw is a salad that is traditionally made mostly of shredded green cabbage. Shredded carrots are added, and the vegetables are mixed with a light, mild dressing. Creamy dressings are sometimes used. These tend to be somewhat on the sweet side. Tangy vinaigrette dressing can also be used instead. Cole slaw can be served as a side dish that goes well with sandwiches, veggie burgers, or any kind of grilled main course. It can also be used as a sandwich or veggie hot dog topping. Packed into individual containers, cole slaw makes terrific picnic fare. Since the base of most cole slaw recipes is shredded vegetables, it's easy to ensure that the finished dish is suitable for vegan diets. Here are two very basic recipes, one with each kind of dressing. Shred cabbage into thin strips, and grate the carrots. Place veggies in a large mixing bowl. In another mixing bowl, combine vegan mayo, sweetener, vinegar, celery seed, salt, and pepper. Taste the dressing and add more sweetener if desired. Pour the dressing over the vegetables and mix well to coat evenly. Refrigerate cole slaw until ready to serve. Prepare exactly as you would the Creamy Vegan Cole Slaw, by first shredding the vegetables, and then mixing the dressing ingredients together. Combine the dressing with the vegetables, and refrigerate until ready to serve. Try adding different vegetables, in addition to the traditional cabbage and carrots. Bell peppers, onions, cherry or grape tomatoes, or shredded zucchini make nice additions. Dried fruit, such as raisins or snipped dried apricots, give a different texture. Add crunch with toasted cashews, almonds, walnuts, peanuts, or pecans. Fresh fruit, like diced apples or pineapple, give cole slaw a completely different flavor. Sesame or sunflower seeds add flavor and nutrition. Try different fresh or dried herbs and spices in the dressing. 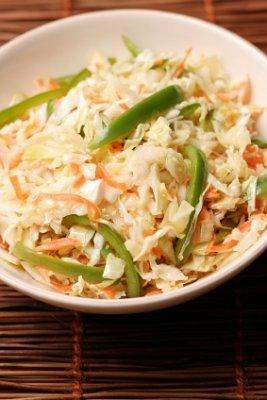 Vegan Cole Slaw - A simple coleslaw with two different kinds of cabbage and carrots. Snappy Crunchy Vegan Cole Slaw - This recipe uses cumin in the dressing, and a combination of green and purple cabbage, along with other veggies and dried fruit. Cole slaw is a very forgiving dish, and it's easy to adjust the flavors and ingredients to suit your tastes.